2018 might be the strongest year for film that we’ve seen in a while. We’ve had the blockbusters covered, with films like Avengers: Infinity War, Deadpool 2, and Mission: Impossible – Fallout. Now we’re heading into the season of horror with Halloween, and more serious movies like the brilliant-looking First Man. Then there’s Bradley Cooper’s first film as director, A Star Is Born, which looks like it could be the best of the year, period. 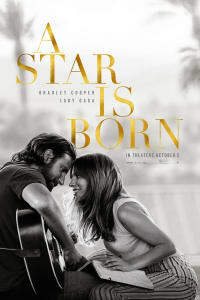 The October 5 release features Cooper as a talented but troubled musician Jackson Maine, who falls for Ally, a struggling performer played by Lady Gaga. 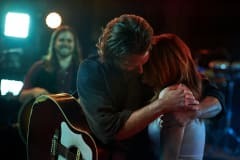 A Star Is Born is the latest version of a story that has been remade multiple times, which should be your first indication that this tale has real longevity. Here’s how Cooper and Gaga are turning a familiar story into the must-see film of 2018. “Maybe it’s time to let the old ways die,” Bradley Cooper sings in the trailer for A Star Is Born. But there’s still plenty of value in old ideas. Sure, the world now is so different from what it was when the original version of this story was released in 1937. But the themes of this story – of believing in yourself, finding support in partnership and community, and the desire to make it big – are as relevant as ever. What gives this version the potential for so much impact is that Cooper has stripped it down, more so than all the previous tellings. It looks raw and intimate – more like an independent film than a lavish musical. Just look at Gaga’s, whose signature flash is totally stripped away. What remains, however, is raw talent. Social media and the overwhelming array of films, television shows, and music can make it feel like we’ve got every aspect of the world right in our laps. But this telling of A Star Is Born offers a specific sort of intimacy that few other stories provide. You think you know everything about Lady Gaga, because that’s what her performing persona is meant to convey. This film will give you something new. Movie musicals aren’t as common as we’d like. So we celebrate great ones whenever they do arrive. Last year, The Greatest Showman was a wonderful surprise. In 2018, we’ve already seen the success of the long-awaited sequel to Mamma Mia!. 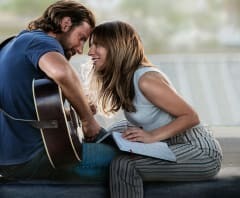 As we mentioned, A Star Is Born is a slightly different kind of musical — but the songs are just as important to the story as they are in a more standard production. Gaga’s song ‘Shallow’ is already looking like a lock for the Best Song Oscar, and that’s just one of the film’s tunes. 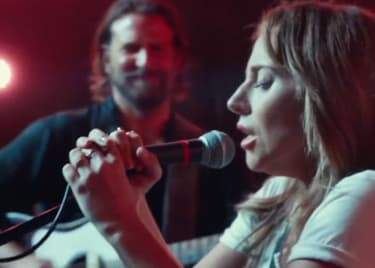 We know Cooper’s character serenades the audience with ballads and emotional rockers, and Gaga belts out heartfelt choruses, as seen in the trailer. A Star Is Born looks like the musical that will define Cooper’s career as a director, and give us both a movie and album to enjoy for months to come. You’ll have the opportunity to receive a free download of the entire A STAR IS BORN album when you see the film two days early only in Dolby Cinema at AMC on Tuesday, October 2. Get your tickets today. 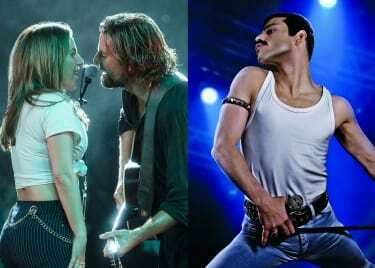 Bradley CooperLady GagaDramaMovies about MusicWarner Bros.